We’d love your help. Let us know what’s wrong with this preview of The Coffeehouse Resistance by Sarina Prabasi. Part coming-to-America story, part lyrical memoir, and yet another part activist’s call to action, The Coffeehouse Resistance: Brewing Hope in Desperate Times is timely, funny, and poignant. Writing as a mother, immigrant, new American, coffeehouse owner, and international nonprofit leader, Prabasi’s story weaves between Nepal, Ethiopia, and the United States. 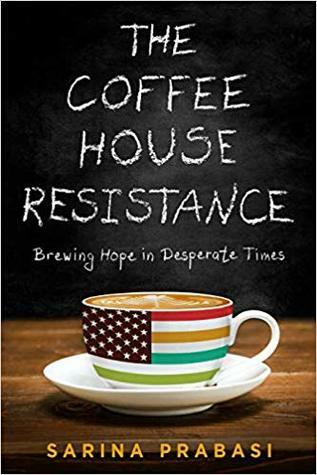 When Prabasi Part coming-to-America story, part lyrical memoir, and yet another part activist’s call to action, The Coffeehouse Resistance: Brewing Hope in Desperate Times is timely, funny, and poignant. Writing as a mother, immigrant, new American, coffeehouse owner, and international nonprofit leader, Prabasi’s story weaves between Nepal, Ethiopia, and the United States. When Prabasi and her husband move from Addis Ababa, Ethiopia, to New York City with their young daughter in 2011, they start a thriving coffee business, grow their family, and are living their American Dream. After the 2016 election, they are suddenly unsure about their new home. To ask other readers questions about The Coffeehouse Resistance, please sign up. Imagine standing close to a large mosaic. You reach out and touch one small piece, marveling at its beauty. Then your eye is drawn to another exquisite tile: so delicately formed; such a rich color. Before long you are pondering another piece; it’s like nothing you’ve ever seen. Only after delighting in each marvelous fragment do you step back to appreciate the whole picture. That’s the experience of reading The Coffeehouse Resistance. Each memory Sarina Prabasi shares is a tiny wonder, drawing h Imagine standing close to a large mosaic. You reach out and touch one small piece, marveling at its beauty. Then your eye is drawn to another exquisite tile: so delicately formed; such a rich color. Before long you are pondering another piece; it’s like nothing you’ve ever seen. Only after delighting in each marvelous fragment do you step back to appreciate the whole picture. That’s the experience of reading The Coffeehouse Resistance. Each memory Sarina Prabasi shares is a tiny wonder, drawing her readers into ordinary moments from her extraordinary life. Even if you’ve never chattered with family around a dining table in Kathmandu, studied while homesick at a funky café in Massachusetts, fallen in love over perfectly crafted cups of macchiato in Addis Ababa, or been stunned by the sweltering summer heat of a Manhattan studio apartment, Prabasi’s artful writing makes you feel like you were there. You will root for Sarina as she and her husband open their first coffee shop, risking family peace and financial security grow a business in their adopted country. And you will agonize with her in the wake of the 2016 election, as Café Buunni becomes more than just a place for great coffee. Only by the end of this compelling mosaic of memoir does the full picture emerge: Sarina Prabasi, a passionate wife, mother, neighbor, entrepreneur, activist, writer, and citizen—of the world, and of these United States. No stranger to immigration, Sarina Prabasi was born in the Netherlands, raised in Nepal, and educated in Massachusetts before settling for years in Ethiopia, where she fell in love with the culture of coffee, the community surrounding it, and a man who would later become her husband and business partner. When political unrest brought her back to America with her husband and young daughter, the relief was short-lived. In the wake of the 2016 presidential elections, they and much of the nation were left shocked, bereft, and seemingly powerless in a situation that few had prepared to face. Suddenly, the future of the nation and of her family was undefined. Through small acts, her mindset emerged from that post-electoral fog as that of an active citizen. She started using her voice, her vote, and even her dining room table, where she and her children wrote to their local representatives, to better embody her ideals. After getting her feet wet by phone banking for Alexandria Ocasio Cortez’s campaign, she was struck by her ability to promote change both at the government level and right within her own community. It wasn’t long before this passion flowed over into Buunni, the coffeehouse founded by Prabasi and her husband, Elias. With the government officials, she wrote postcards, made phone calls, and attended rallies. With her customers, she shared a love of coffee, a safe space for their voices to be heard, and connections with friends and strangers alike. Eventually, she found a balance, dismantling the isolating issues she saw—racism, gun violence, and corporate greed—from both ends of the spectrum. In an effort to bring the coffeehouse back to its original status of communal hub and a place of enlightenment, free thinking, and debate, Prabasi has written a book detailing her experiences as a New York immigrant-turned-U.S. citizen, a small business owner, a mother, and a political activist pining for representation in Trump’s America. This is a very readable story of vignettes, from childhood to now. The pacing is well-plotted and big themes, such as the decision to move to America, starting a busines, getting an education and meeting her now-husband are told over a series of memories, memories that really draw you in and make sense of far-flung places and cultures. It captures lots of moments in time and I read it in two sittings. Two! This is a book we all need right now - a powerful memoir of a mother, business woman and activist who tells a coming of age story around the idea of coffeehouses as a nexus of family, community, and political action. I'm buying copies for friends and family. Prabasi comes across as a trustworthy go-getter. Beyond her formidable accomplishments as an entrepreneur, humanitarian and parent, perhaps she commands even more respect with her warm, earnest voice and belief in virtue for its own sake. Her story gifts the reader with profound lessons and beautiful settings (so many gorgeous moments, as in the portrait of Ethiopia). When do-gooders like her are leading the resistance, we know it's time for change. High recommend. I so enjoyed reading "The Coffeehouse Resistance" - a memoir by Sarina Prabasi. I read nearly the entire book in one sitting! It is a beautiful story that crosses multiple cities and covers various significant times in the author's life. I very much enjoyed how coffee served as backdrop and connector weaving together various chapters of the story. I especially enjoyed learning about the culture of coffee in Ethiopia. The author's writing is lovely and painted such amazing images of the setting t I so enjoyed reading "The Coffeehouse Resistance" - a memoir by Sarina Prabasi. I read nearly the entire book in one sitting! It is a beautiful story that crosses multiple cities and covers various significant times in the author's life. I very much enjoyed how coffee served as backdrop and connector weaving together various chapters of the story. I especially enjoyed learning about the culture of coffee in Ethiopia. The author's writing is lovely and painted such amazing images of the setting that I felt as if I was there! Overall I found this book to be one that so many people will enjoy. The themes of home, love, connectedness, and optimism shine through. And, I think every reader will relate to these universal topics and feel inspired by the author's bravery and vulnerability in sharing her hopes and fears. I didn't know what to expect from this book, but found myself drawn in from the very first pages. Sarina's voice is calm but you hear her underlying passion for justice and life seething underneath - and moving both the book and our hearts forward. A much needed book for our troubled times. A cup of coffee with a friend you might not have known you had (to paraphrase another fan). Extremely readable, extremely enjoyable - Coffeehouse Resistance makes me want to simultaneously phone my Senator, pick up a good novel, travel somewhere new, and reflect upon and take action on promises not yet delivered.